(Rose M. [Mrs. Augustus] de Forest, New York); sold 2 August 1921 to Thomas B. Clarke [1848-1931], New York; his estate; sold as part of the Clarke collection 29 January 1936, through (M. Knoedler & Co., New York), to The A.W. Mellon Educational and Charitable Trust, Pittsburgh; gift 1947 to NGA. The name of the seller and the date of the purchase by Clarke are recorded in a copy of Portraits by Early American Artists of the Seventeenth, Eighteenth, and Nineteenth Centuries Collected by Thomas B. Clarke (Exh. cat. Philadelphia Museum of Art, 1928) annotated with information from files of M. Knoedler & Co., NY (copy in NGA curatorial records and in NGA library). Exhibition of Paintings by Early American Portrait Painters, The Union League Club, New York, November 1921, no. 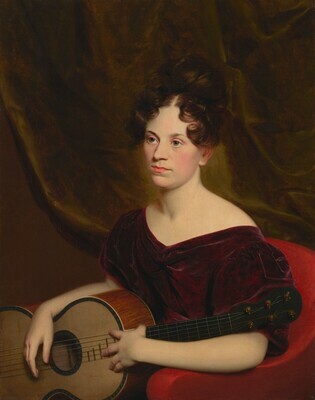 8, as Coralie Livingston Barton by Samuel F. B. Morse. Portraits by Early American Artists of the Seventeenth, Eighteenth and Nineteenth Centuries, Collected by Thomas B. Clarke, Philadelphia Museum of Art, 1928-1931, unnumbered and unpaginated cat., as Coralie Livingston Barton by Samuel F.B. Morse. Picturing Gentility: Portraits of Women in American Art, The Hyde Collection, Glens Falls, New York, 2000, unnumbered catalogue, fig. 6. Barker, Virgil. "Portraiture in America before 1876." The Arts 13, no. 5 (May 1928): repro. 285, as Coralie L. Barton by Samuel F.B. Morse. Portraits by Early American Artists of the Seventeenth, Eighteenth and Nineteenth Centuries, Collected by Thomas B. Clarke. Exh. cat. Philadelphia Museum of Art, 1928, unnumbered, as Coralie Livingston Barton by Samuel F. B. Morse. Sherman 1930, 37, as Coralie Livingston Barton by Samuel F.B. Morse. Rutledge and Lane 1952, 91-92. American Paintings and Sculpture: An Illustrated Catalogue. National Gallery of Art, Washington, 1970: 70, repro. American Paintings: An Illustrated Catalogue. National Gallery of Art, Washington, 1980: 179, repro. American Paintings: An Illustrated Catalogue. National Gallery of Art, Washington, 1992: 208, repro. Kelly, Franklin, with Nicolai Cikovsky, Jr., Deborah Chotner, and John Davis. American Paintings of the Nineteenth Century, Part I. The Collections of the National Gallery of Art Systematic Catalogue. Washington, D.C., 1996: 342-345, color repro.